I was listening to the Frankly Speaking Podcast the other day and was put onto a great new game for the Windows Phone 7 called Wordament. It’s essentially a word search game, but played in real time against other players on the internet. The board consists of 16 tiles and you have 2 minutes to try to find as many words as possible by dragging your finger from one letter to the next. At the end of the 2 minutes you get to see the words you missed, then get shown a leader board to see how you went against your online competitors. I’ve never been big on word games like boggle or scrabble, but the fast pace and the multi player aspect of the game gets you totally hooked in very little time. One of the best recipes for phone games is they are easy to play, but take a long time to master, plus, you can play for as little as a few minutes or can play all day and this game certainly fits that bill nicely. You’ll go to bed and think, I’ll just have one quick game, and before you know it you’ve been sitting there playing for an hour. I’m totally addicted, not to mention the other great thing is that the game is free. Definitely give it a try. Further from my recent post on Google Mail Filters, another rule that I had setup in Outlook was to move emails that originated from outside my organisation into a separate folder "Inbox – External". This way marketing information, or newsletters for example wouldn’t clutter my inbox. 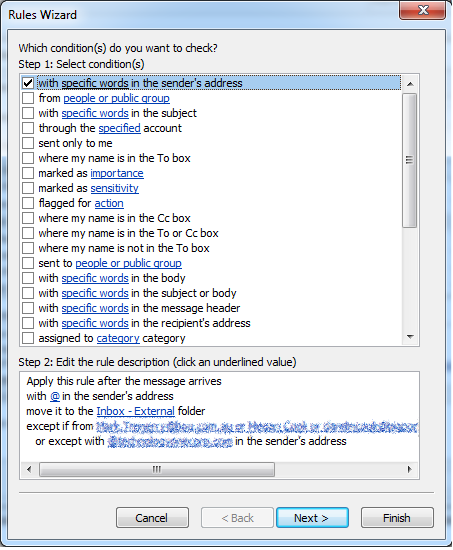 There isn’t a predefined scenario in the Outlook Rules Wizard to handle this, but you can achieve the desired result by setting the “with specific words in the sender’s address” to “@” and adding an exception “except with @myorganisationdomain.com in the sender’s address” as shown below. Effectively the rule states that all emails except those originating from my organisation should get moved to the defined folder. You will see in the screenshot that I also have exceptions for specific individuals and domains. What I found was that after setting this rule up, I was missing important emails as they were being moved out of my Inbox. For example, emails from the client of the project I was working on, my car pool buddy (in case he was leaving early that day), and of course my wife. Effectively you can set these up as exceptions to the rule by adding them to “except if from” or “except with @clientdomain.com in the sender’s address”. Now that we have moved to Google Mail, I wanted to replicate the rule in the Google Filters.